Gentleman Jack in the new bottle. January 03, 2009 by Alphageek in "alphageek gentleman jack whiskey new bottle"
Life can get confusing sometimes. Just when I was beginning to get a list of bourbon and whiskey to keep in the house, life threw me a curve. The fine makers of Gentleman Jack Tennessee Whiskey decided to change the bottle. The original purpose of this site was rather simple. Take pictures of bourbon and write my impressions. Really, that is where the idea started. Anything beyond that has grown out of inspiration from the original idea. Today's lesson is really simple. 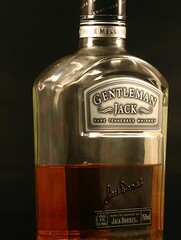 The bottle of Gentleman Jack has been redesigned. I like this design, but I was attached to the old bottle. The old bottle was one of the first premium spirits I can remember. Back in those days, Stolichnaya and Smirnoff were considered fancy vodkas. Today, those brands are very run of the mill. Gentleman Jack helped usher in a new era of pleasure, at least for the Alphageek and make many bourbons run of the mill. It also preceded many of the premium bourbons that we have on the market today. I also am announcing that the web site design will be tweaked stating as of this post. Without getting into details (unless I get a bunch of feedback wanting to hear the details), none of you are using any of the links I add to articles or any of the applications on the left. I will go for a more simple, clean post from now on. Until next time, enjoy a Gentleman Jack today! "alphageek gentleman jack whiskey new bottle"